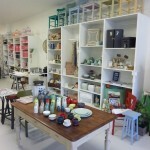 It began with using my own old farm table in the shop for a display table. So many people wanted to know if it was sale (it wasn’t ! 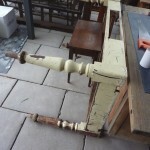 ), I knew we needed to find some old farm tables to do up and have in the shop. Ian got the task to work on this and before too long he had an opportunity to go view some old furniture at an old house and shed that was being cleared out. He agreed to buy two of the old tables they had on offer there, but not a third. However, in the end, he grudgingly agreed to take it too (he did not think it could be saved). As it turned out, I was delighted with the three tables. I thought he had done very well indeed when he turned up in the shop work area to unload the three very roughand worn, tired looking tables. Before long, the first of the three went into our off site workshop (the one nearer all Ian’s tool’s ! 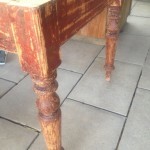 ), to begin the repair & restoration work of these tables. 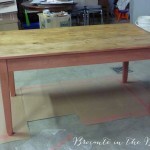 It has taken monthsfor all three tables to come out of the workshop. One had to be painted completely, due to its extensive repairs on top (nearly have the top had to be replaced). Another had to have a new plank put on top to repair its top too. 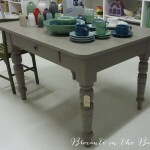 We painted its base inChalk Paint TM decorative paint by Annie Sloan (Scandanavian Pink) and used Annie Sloan Soft Wax in dark finish to stain the new plank and come as close as we could to the look of the original plank on the table top. It provides work area storage and is also available for hire. 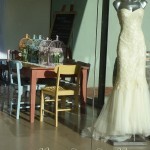 We took it to a wedding expo last month, to show it off ! The best one was saved for last, and it also needed the most work. 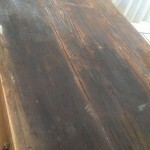 Turns out it is quite an old table, about 110 years old plus a bit (age set dating to circa 1900). Ian hd to take it apart, repair and restore it, and then put it back together again. 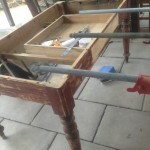 Below photos show the table base, with clamps on it as it is in the early stages of putting-back-together-again process ! 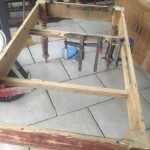 The base had been taken apart, filled, repaired, the drawer repaired, knob handle on the drawer was sheared in half and Ian painstakingly machined out a new other half for it, after gluing the original half we had to a timber block. It looks perfect and whole again ! (see top photo above). The table top was rough and needed a lot of filling work. But great care was taken not to ruin the original character of the piece, and that meant extra work to restore the top surface, as we know it would be finished and on display. We wanted to retain all we could of its character. 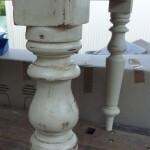 You can also see how the original paint was at one time redoxide style and colour paint. This informed our paint choices. 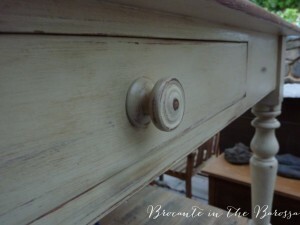 When the table was put back together, we painted the base in three layers of Chalk Paint TM by Annie Sloan. Primer Red was used to echo the original first layer of paint the table had had. Then a coat of Arles went on. 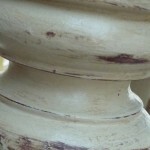 And last court was Old Ochre, a light neutral that picked up the original paint work colour (see above). The entire Old Ochre coat was given a clear wax with Annie Sloan Soft Wax. And we began some distressing to reveal the paint layers underneath. This was followed by clear wax again, and then dark wax was applied and artfully rubbed back. The wax work took two days to complete. But the detailed work on the base was excellent and came out well. 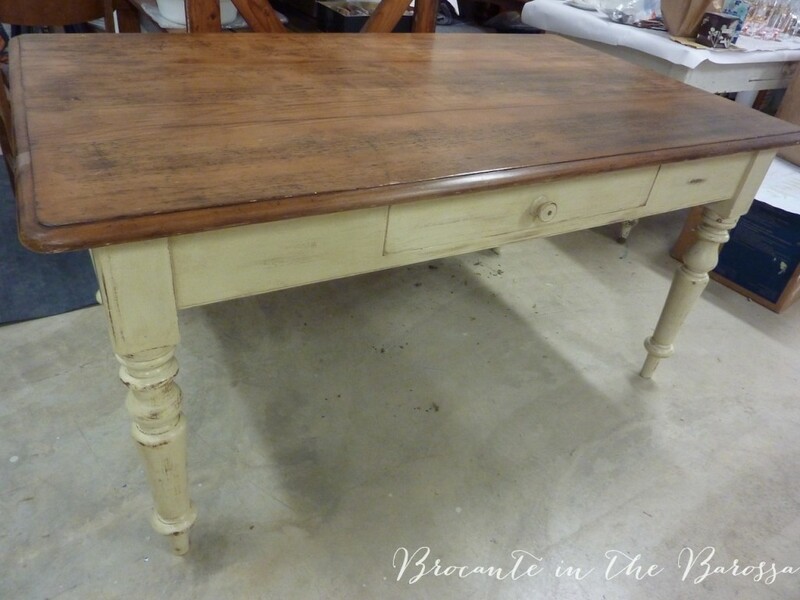 When the table was ready to come out of the workshop2 weeks ago, it was brought back to the Brocante in the Barossa shop. 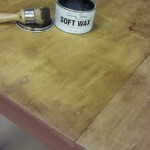 I applied a coat of clear wax to the top and then worked in a generous amount of dark wax. After leaving it to dry I gave it all a good polish and buff. I love how this came out, it looks amazing ! The table looks magnificent and is a credit to its history and character, which it proudly wears, but with a new look and restored to readiness for its next 100 years ! And I have dubbed Ian the “Furniture Doctor”…He does amazing work on these old pieces and fixes them without diminishing their character or integrity. 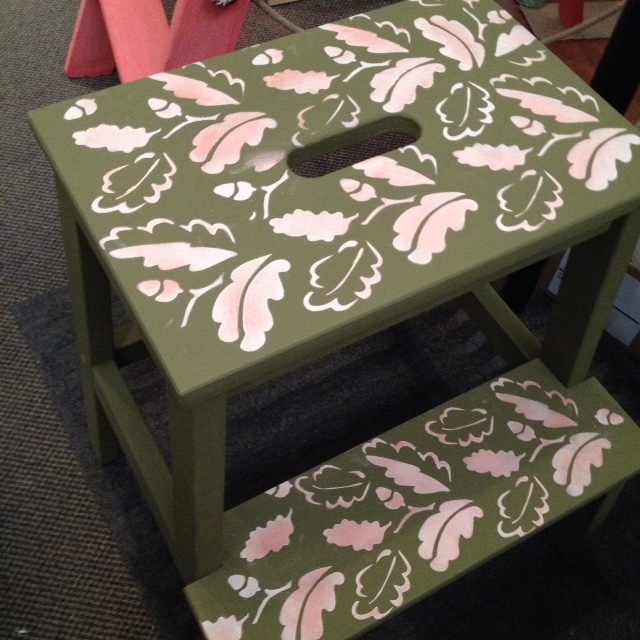 This table now has pride of place in centre of our boutique floor, with beautiful ceramics on display on its top. And it sports a price tag too. Though, I confess–I am not all that keen to see it go anywhere anytime soon !